One of my favorite places to go is the Melting Pot. 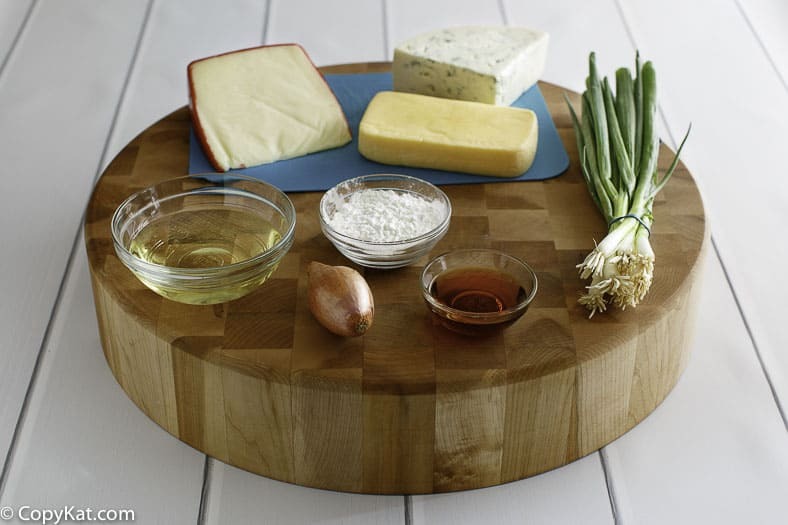 My favorite here is their Melting Pot Wisconsin Trio recipe, it has a combination of cheeses that is heavenly. It is a whole restaurant that you enjoy every course by having fondue. One of my favorite places to go is the Melting Pot. My favorite thing to order there is the Melting Pot Wisconsin Trio fondue. This fondue has a combination of cheeses that is heavenly. 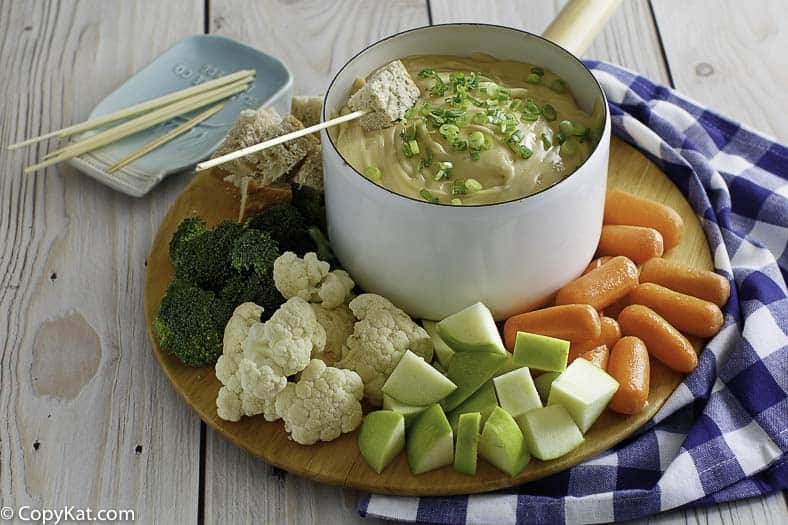 While you may not get to go to the Melting Pot every day, there’s no reason why you can’t enjoy fondue at home with this Melting Pot recipe. What Kinds of Cheeses are in this Fondue Recipe? This Melting Pot Wisconsin Trio recipe has butterkäse, fontina, and blue cheeses. I can usually find these cheeses at the deli counter in my grocery store. A reader substituted Havarti for butterkäse (because she couldn’t find it) and said that it worked well. Butterkäse is a German word that literally means butter cheese. It’s a cheese that’s mild enough so your kids will love it – it makes a killer mac and cheese – yet sophisticated enough to serve with fine wines at your next wine and cheese party. Fontina originated in the Italian Alps where cows graze lush meadows to provide the rich and creamy milk needed to produce fontina. The flavors of this cheese are pungently sweet, unveiling tones of roasted nuts and butter as this fine cheese lingers on your palate. What Kind of Wine is in this Fondue Recipe? This Melting Pot Wisconsin Trio recipe requires a dry white wine – a Chablis or Chardonnay will work. If you don’t have either, pick something white and dry (not sweet), and use that. A reader said she used Pinot Grigio (because she could not find butterkäse) and it worked well. My suggestion is never to use cooking wine, but a wine that you will also enjoy drinking. A good recipe that includes wine needs a good wine. Fondue can become lumpy if it is overheated, but you can rescue it. What to do? Add a couple of tablespoons of warm alcohol, stir, and turn down the heat to low – cold alcohol will result in more lumps. If the alcohol and the cheese continue to be separate from each other, you can add about 1/2 a teaspoon of cornstarch and stir. The cornstarch is a last resort because it can change the texture of the fondue, but it will help bind the cheese and the alcohol together. Do you love fondue? Try these cheese fondue recipes. 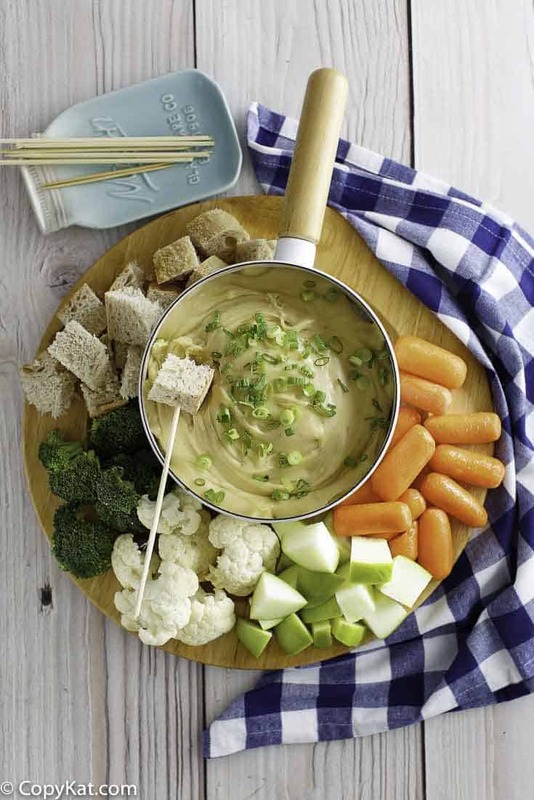 Enjoy this copycat of the Melting Pot Wisconsin Trio Cheese Fondue Recipe. In a bowl, stir the butterkase and fontina cheeses and the cornstarch together so that he cheese is coated with the cornstarch; this is what will help the fondue thicken. in either a double boiler over simmering water or a fondue pot, heat the wine, sherry, and shallots together for a minute or two. Add approximately half the cheese mixture and whisk constantly until the cheese is melting. Add the remaining cheese by handfuls, whisking until everything is incorporated. Finally, stir in the blue cheese and pepper. Just before serving, top the melted cheese with the green onions. 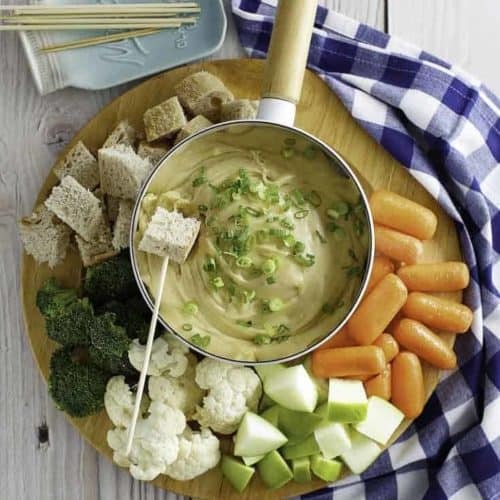 Offer the green apple slices, broccoli, cauliflower, carrots, and bread for dipping into the fondue. You may want to add additional warm alcohol to the fondue (cold alcohol will make the cheese will become more clumpy), as the clumpiness may come from overcooking. So you can reduce the temperature of the whole mixture, be sure to turn the heat down to low. Continue to stir and the clumpiness should start to subside. Add in 1/2 tsp. cornstarch and stir it in if the cheese is separating from the alcohol. The cornstarch is a last resort because it can change the texture of the fondue, but it will help bind the cheese and the alcohol together. Are there any good substitutes for the alcohol for us non drinkers? You should saute them in initially. This was wonderful. I substituted havarti for butterkase (because I could not find butterkase) and used pinot grigio for the wine. It is a dead ringer for the real thing! I love the Melting Pot. My favorite is the Swiss Cheese, but I will give this one a try as well. I love the classic one too! What is your favorite type of fonue?